Looking for a fun alternative to exercise? 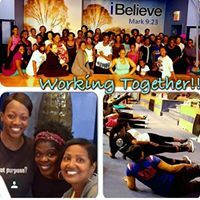 TurneRound Fitness, LLC can organize and host the party...we can bring the party to you! Packages can be tailored to fit your party's specific needs and requests; simply call us and we'll do our best to accommodate you. Click <here> to see pictures from one of our fitness parties. GameWorks: (Ages 3–12) Enjoy a collection of games and relays featuring fun for all ages. Everyone will enjoy this high-energy experience. Kiddie Kicks: (Ages 5–10) Punch, jab, kick and shout! Experience a unique blend of boxing and kickboxing as guests participate in this high-kicking match. Expand your fun by adding an extra 30- minutes of activity to any party. There is an additional cost for this service. new! Adult FunFit: (no age restriction) Looking for something NEW and FUN ? Let TurneRound Fitness get the party started. Every adult is welcome regardless of age, flexibility, or fitness level. Parties are 1.5 hours. Includes 15 min of nutrition and fitness presentation. 45 min of a combination low-high impact cardio and strength training. 30 min of munch and mingle. Parties run 1.5 hours. They are designed for 15 guests including the birthday child who is FREE. There is an extra charge for each additional child exceeding 15. Party includes: 45-minute activity, invitations, party coordinator and cleanup. $135.00/15 kids. ($8 ea. additional child) Provide your own cake. Includes invitations, balloons, paper goods, and juice. $175.00/15 kids. ($9 ea. additional child) includes same as above with slice of Pizza or hot dog, and personalized Birthday cake. Includes party favors with food, personalized birthday cake, invitations, balloons, paper goods, and juice. Includes party coordinator, drinks, paper goods, invitations, healthy refreshments, and clean up. HURRY BOOK YOUR PARTY TODAY !